Home > Who Needs Housing That’s Affordable? Home is safety and security, where children can do homework and families can succeed. 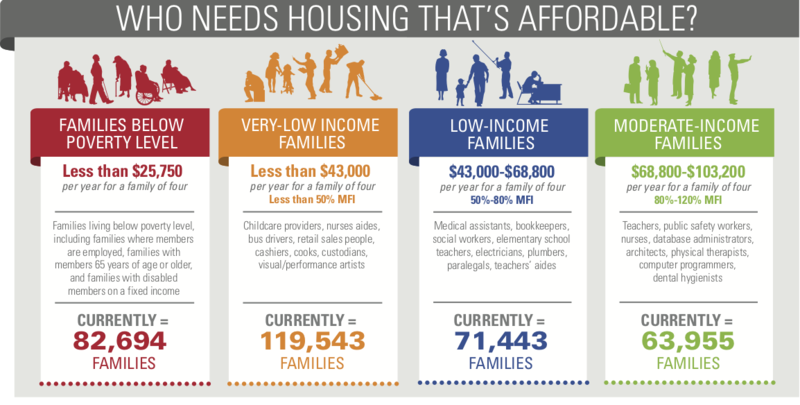 But having an affordable home is a challenge for many in our community. What is affordable housing? Typically, housing is a household’s largest monthly expenditure. The federal government defines affordable housing as costing no more than 30% of a household’s gross income. If your housing costs are reasonable, that leaves money for other household expenses, including food, healthcare, clothing, education, and transportation. Who needs affordable housing? We all need affordable housing. That includes people who live on fixed incomes (like seniors and people with disabilities), low-wage working families, and middle-income families. Affordable housing is part of the fabric of our community. By ensuring that we have housing affordable to a variety of income levels, we ensure that Austin is a place all type of people and households can call home.